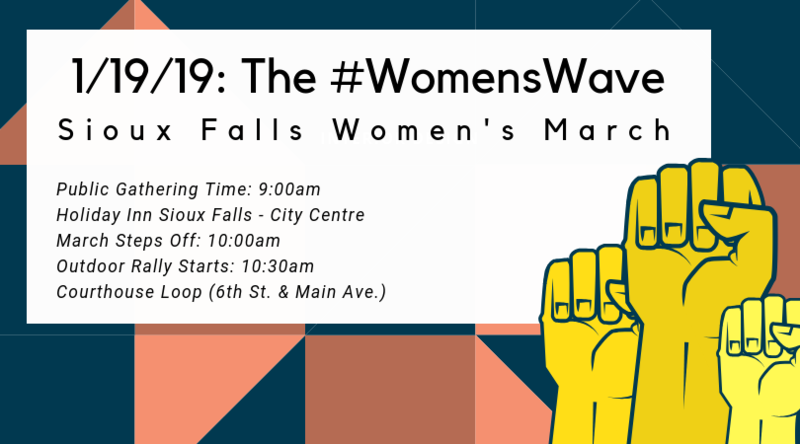 Join us for the Third Annual Sioux Falls Women's March at 9:00AM at the Downtown Sioux Falls Holiday Inn-City Centre. We'll have coffee, light refreshments, and sign-making materials available for marchers. Speakers will begin at 9:30AM sharp and the march towards the Minnehaha County Courthouse loop steps off at 10:00AM. If you have any questions or would like to volunteer, contact us at siouxfallswomensmarch@gmail.com.